Whispers in the Loggia: A New Marian Feast... Another "Montini Moment"
Five years in, one of the dominant leitmotifs of the Rule of Francis is how a great deal of the current pontificate and its priorities derives, in a fairly direct line, from the unfinished business of Paul VI – so much so that it sometimes feels like the intervening period didn't happen... well, almost didn't. Indeed, pick any top-shelf, long-term Bergoglio project and odds are it finds its roots in what he's termed Montini's "farsightedness and wisdom" on Peter's Chair – from completing the simplification of the papacy to the internationalization of the College of Cardinals (both reforms which Paul began in earnest), to Francis' return to the foundational role Paul intended for the Synod he founded, the shared activist approach to poverty, justice, peace and human development, to Francis' recovery of the "pastoral document" – a style Paul first charted with Evangelii Nuntiandi, which has now found its modern echo in the just-released Gaudete et Exsultate, arguably the most accessible, most personal teaching text a Pope has issued in recent times. 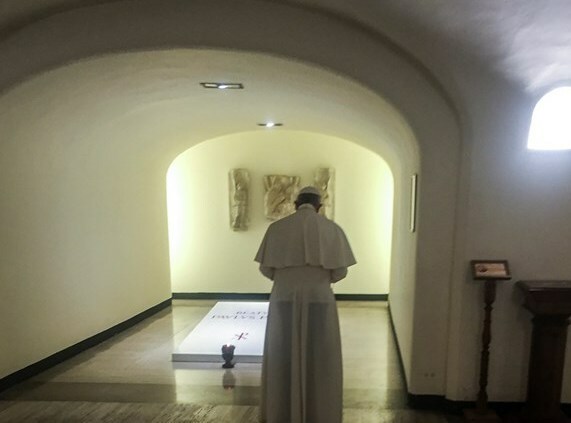 Along these lines, it bears recalling that while Francis has finished what his two immediate predecessors respectively started in declaring the sainthoods of John XXIII and John Paul II, Paul is the lone Pope who will be both beatified and canonized by the same pontiff. As the 40th anniversary of his death approaches in August, this Pentecost weekend brings two more "completions" by Francis of Papa Montini's work: first, there was yesterday's formal announcement of Paul's canonization on October 14 (alongside Blessed Oscar Romero and four others: two priests and two religious women) and, in a particularly poignant move, tomorrow's first celebration of a universal memorial of Mary, Mother of the Church – the title declared by Paul toward the end of Vatican II – which the Pope decreed in February would be marked each year on the Monday following the "birthday of the church." 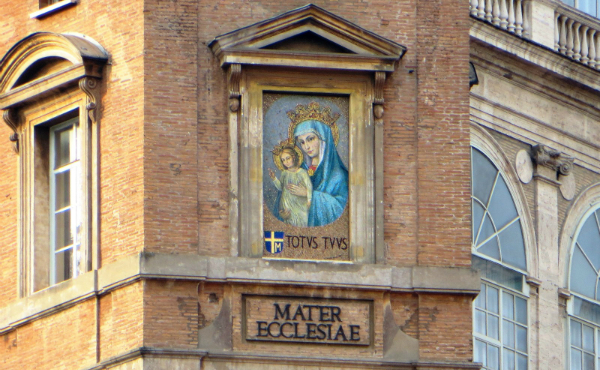 Most of all, though, given these milestones, the wider confluence they represent – and as an aid for homilies or other reflection on Monday's feast – below is Blessed Paul's original declaration of the Madonna as Mater Ecclesiae, which he delivered at the close of the Council's third session. Fittingly, this text will serve as the proper Second Reading of the Office of Readings for the new feast. This corresponds to the aim which this council set itself of manifesting the countenance of the Holy Church, to which Mary is closely linked, and of which, as it has been authoritatively affirmed, she is portio maxima, portio optima, portio praecipua, portio electissima (the greatest, finest, principal, most elect part) (Rupert, in Ape. I, VII, c 12, P.L. 169,10434). While we turn in ardent prayer to the Virgin, that she may bless the ecumenical council and the entire Church, hastening the hour of the union of all Christians, our glance opens on the endless horizons of the whole world, the object of the most lively care of the ecumenical council, and which our venerated predecessor, Pius XII of venerated memory, not without inspiration from on high, solemnly consecrated to the Immaculate Heart of Mary. Today, we consider it particularly opportune to recall this act of consecration. Bearing this in mind, we have decided to send a special mission to Fatima in the near future in order to carry the Golden Rose to the sanctuary of Fatima, more dear than ever not only to the people of the noble Portuguese nation — always, but particularly today, dear to us — but also known and venerated by the faithful throughout the entire Catholic world. In this manner we intend to entrust to the care of this heavenly Mother the entire human family, with its problems and anxieties, with its legitimate aspirations and ardent hopes. And let the entire Church, by celebrating this great ecumenical assembly, raise to the God of mercy the majestic hymn of praise and thanksgiving, the hymn of joy and of exultation, because the Lord has worked great things through you, O clement, O loving, O sweet Virgin Mary.